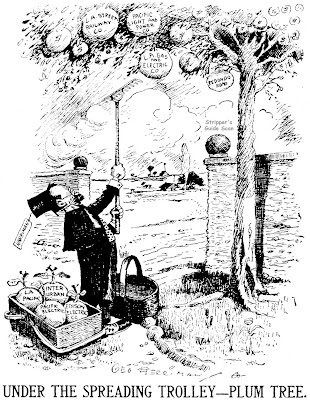 These cartoons are from December 13 and 14 1906. 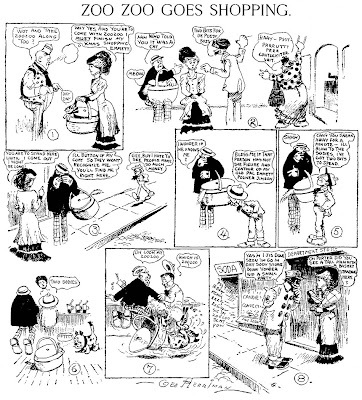 The second, with Zoo Zoo regaining the starring role, is the third in Herriman's comic strip series. I deleted your comment. I love comments but please do it without any profanity. I'm not a prude, but I don't want the site to get filtered out of searches because it's off-color. Outer Space versus Wide Open Spaces has been the big debate in comic strip circles in recent months. Science fiction devotees have laid claim to the Westerns' previous mantle of pre-eminence, while cowboy interests have termed the space stuff a mere flash in the pan. The science fiction trend, which several months ago brought on a heavy crop of new interplanetary strips and old strips converted to science fiction, seems to have quieted down a bit. Until this week, that is, when United Fea­ture Syndicate gave the whole thing new impetus by announcing "Twin Earths," described by the syndicate as a "realistic" science fiction strip. The list of papers signed in advance is impressive. The theme of "Twin Earths" is that there is a planet called Terra, a twin and counterpart of our Earth, travelling along the same orbit but hidden from us by the Sun. The people of Terra are some years ahead of us scientifical­ly, and have invented spaceships— remember those flying saucers?— from which to snoop on Earth. They've even got agents working here. One of these, a girl named Vana, who will be with the strip throughout, turns herself in to the P.B.I, and gets the plot of "Twin Earths" under way. She is taken in hand by Garry Verth, assistant director of the bureau, who will serve as the strip's male lead. That about takes care of the first six weeks of daily releases, and what happens next is anybody's guess. One more detail—for some ob­scure reason, 92 per cent of the people on Terra are women. Some of the action in "Twin Earths" will take place on Terra, some on Earth, and some on space-ships in between. There'll be no interplanetary warfare, though. Creator Oskar Lebeck says he intends to keep "Twin Earths" on an adult level, even make it slightly educational with­out tampering with the strip's pri­mary function as an entertainment medium. Though Mr. Lebeck is writer, not artist, on the "Twin Earths" strip, he is a past master of brush and pen. He began his car­eer as a stage designer for Max Reinhardt in Europe, later worked for Ziegfeld and Earl Carroll on Broadway. After working as an industrial designer for several years, he joined Western Printing and Lithographing Co. and the Dell Publishing Co. as art director and managing editor of comic books. He is now in semi-retire­ment, though still a consultant to Dell. Mr. Lebeck is author of three books of science fiction. The artist who will execute Mr. Lebeck's ideas of the future, in­cluding such items as houses made of Polaroid glass which turn with the position of the Sun and chemical food factories which grow or­ganic foods, such as meat, in syn­thetic forms, is Alden McWilliams. 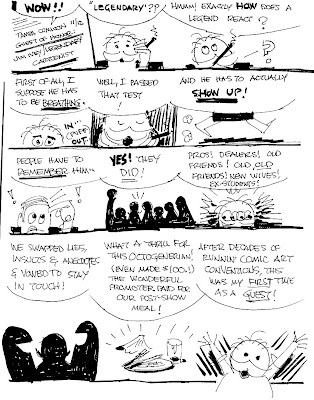 He is a veteran comic book illus­trator and has also done some newspaper strip work. "Twin Earths" will be available for daily six-a-week release be­ginning June 16. A Sunday page, following a separate story line, is in the works. Here's Jack Wohl's Versus. It stars a little fellow named Walter, his wife, his brother-in-law Bert, and a giant named Sherman. Caught ya off-guard with that last one I bet. Sherman the giant, who unfortunately doesn't appear in these samples, makes a regular habit of stepping on Walter. A veiled attempt (gossamer thin) at a message about the little guy against a big bad world. 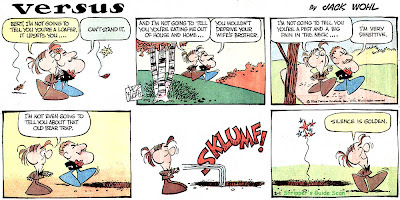 Wohl did this daily and Sunday strip in addition to his more famous Pixies feature (which we might well cover tomorrow since I have some samples right here in my mitt). Versus didn't catch on all that well, though. The art was excellent but the gags, well, they were okay but pretty forgettable. Not an uncommon problem when a creator tries to juggle multiple features. Versus was syndicated by King Features from October 13 1969 to April 8 1973. You can also see daily samples of the strip at this site. Unfortunately, these are in Portuguese. United Feature Syndicate's newest comic strip has the rare distinction of being written by a newspaper publisher and drawn by an editorial cartoonist. What's more, the strip features a talking mule who will be venturing into the newspaper business in a month or two. The mule, of course, is Francis, already famous—or notorious—as a result of two best-selling books and two hit motion pictures. Francis is the brainchild of David Stern, publisher of the New Or­leans Item, who is writing the con­tinuity for the comic strip. Artwork is by Cliff Rogerson, former free-lance artist and one-time assistant to the late Billy "Barney Google" DeBeck at King Features Syndicate. Mr. Rogerson has been editorial cartoonist for the Garden City (L. I.) Newsday since 1946.
has the innate veracity of a pub­lisher, maintains that the mule really exists. He claims to have met him after the war in the South Pacific, where Mr. Stern was con­nected with the Middle Pacific edi­tion of Stars and Stripes. He further claims that the ad­ventures detailed in two books, "Francis" and "Francis Goes to Washington," are straight from the mule's mouth. At any rate, the books and the two movies based on them did well. Two more Hollywood epics on Francis are due to be released this year, with more to come later. As a United Features strip, Francis made his six-a-week news­paper debut this week. A Sunday page is in the works [never happened - Allan]. In the strip Francis is a tough ex-Sergeant who "has seen everything, done every­thing twice, and doesn't like it." For the first 10 weeks of the strip, Francis and his side-kick, ex-Second Lieutenant Peter Stirling, will be exposing themselves to the hazards of the television industry. 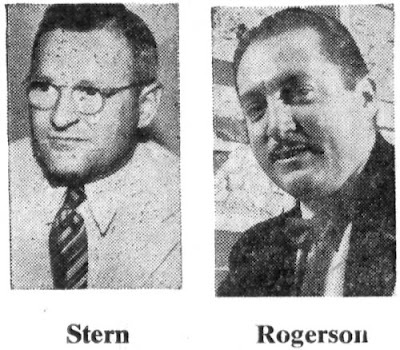 On the basis of advance proofs, Messrs. Stern and Rogerson take a dim view of the new medium. Next stop will be a newspaper se­quence, which may be protracted for some time, unless the boys in the city rooms holler too loud. Here's a rare batch of strips by Fred Fredericks, well-known artist on Mandrake the Magician. Depending on who you believe, New Jersey Patriots (aka New Jersey's Patriots) ran in 1959 only, 1957-59, 1956-59, 1957-60 or any other combination of late 1950s dates you care to come up with. With any luck there's some Fredericks fans out there who can give us some more authoritative information. These samples, provided to Stripper's Guide by Cole Johnson (thanks Cole! ), are all from 1959 - a miscellany of dates from May to October. The Revolutionary war history strip was syndicated by Superior Features Syndicate, probably Fredericks' self-syndication company. This was one of several historical strips done by Fredericks before being tapped for duty on Mandrake. There was also Under The Stars and Bars and a strip that was advertised but I've not seen, The Late, Late War. Around this time and into the sixties he also did a lot of work on Dell's Twilight Zone, sometimes whole issues. Quite an impressive artist, more so than Mandrake on it's own would indicate. What an interesting web blog. I have a number of sunday comics from the San Francisco Bulletin from the year 1902. I have identified two of the artists as Thomas Dorgan and Grant Wallace. They are single page comics in a very primative four color presentation for the most part and they are in very good shape considering they are over 100 years old. Can anyone out there assist me in finding out more about these comics? Thanks for some interesting reading. Thanks. New Orleans—Tradition lov­ers sent up a mighty cheer this week when The Picayune Frog emerged victorious over Pogo the Possum in a stormy "weather derby." Frog's the winner by a 5,170 to 4,087 count. He thereby earns squatter's rights as official illus­trator for weather stories in the Times-Picayune. Pogo will continue to entertain readers of the Times-Picayune with his comic strip antics. And, in case of an emergency, he'll sub­stitute for The Picayune Frog. The Picayune Frog vs. Pogo weather derby proved again just how newsworthy the weather real­ly is. The contest ran for one week. On the final day of balloting, 2,839 votes were cast. It started quite innocently. Some weeks ago, Pogo—with an occasional assist from Albert, the alligator—began helping the weather editor. His appearance immediately brought letters from readers who, invoking the power of tradition, wanted this usurper Pogo ousted and The Picayune Frog reinstated. Frog was guessing the weather in the Picayune back in 1894, and for 20 years thereafter. He was one of the many inspirations of Mrs. Eliza Jane Nicholson, co-owner with her husband, George Nicholson, of the Picayune at that time. One of the great newspaper-women of her day, the late Mrs. Nicholson decided her readers should have a weather prophet ca­pable of tickling their funny-bones as well as passing along predic­tions. She inspired cartoonist L. A. Winterhalder to create a dapper, pot-bellied frog with rolling eyes and a swagger rear. With a top hat and cane, smoking a cigar, holding a fan or an umbrella, his rakish posture told what to ex­pect that day in a weather way. The Picayune Frog was an im­mediate hit from his first appear­ance on Jan. 13, 1894. He be­came the theme for dancing acad­emy programs, was borrowed for book store campaigns and rode on a Carnival float. Later he achieved fame on the Children's Page when he organized a Frog Circus. He was even the model for souvenir spoons. With his crafty look and de­bonair appearance. Frog reigned for 20 years. And the current weather derby proved his loyal followers haven't forgotten him. When the "Frog" first made its advent in New Orleans as the "Weather Prophet" of the Picayune, and appeared daily at the head of our "Guide to the Weather" column, arrayed in various garbs, indicating the kind of weather one might expect for- the next twenty-four hours, enthusiasm for the "Picayune Frog," as our prophét was immediately dubbed, was very great. Not only did the great popular heart go out to Froggie, but the most exclusive circles caught the idea, and "Picayune Frog Teas," "Picayune Frog Pins," "Picayune Frog Calendars." menu cards, etc., with the pictures of Froggie in his amusing garbs became the fashion of the hour. No entertainment, no reunion, no fair, or children's party was considered complete without the presence of the Picayune Frog. The Frog soon became the "mascot" of every charitable and philanthropic entertainment, the booths at which he was invited to take up his headquarters generally carrying the fair. Cakes and drinks and fashionable dishes were named in his honor, and so great was his popularity that a famous old chef in the French Quarter, unable to control his enthusiasm for the little frog, who had left the bayous and swamps of this old Creole State to take up his abode in a great newspaper office, complimented him with an original dish named in his honor. "Picayune Frogs il la Creole." Froggie, always ready to adapt himself' to circumstances, at once responded the next day by appearing as a waiter serving the dish. Subsequently, on occasions of great festivals in New Orleans, such as Thanksgiving, Christmas, New Years, etc., Froggie always appeared in this conventional garb, ready, as he said, for duty. And so when the Picayune published its Creole Cook Book, Froggie., who, as distinguished critics aver, "is able to do all things and do them well." delighted the public by offering to serve the dishes which the old Creole Cook so faithfully portrayed in the cut presented for their delectation. thanks for the article on the Picayune weather frog. Do you know where I can see past pics of him? I think there was one in the Google Books link. Just to clarify one of your points, Eliza Jane Nicholson owned 75% of the Daily Picayune, with her husband George owning the other 25%. She inherited 100% of it from her first husband, Alva Holbrook, and Nicholson bought into the paper between Holbrook's death and the marriage of the Nicholsons. The 75-25 ownership was still in place at the time of their deaths. May I take a moment to tell Jim how much I enjoy his ramblings? I like the randomness of it and the honesty. It also hold up as a cartoon with some very nice 'inventions' like the way he divides anecdotes by a bold line between the panels. So much of the 'tricks' of comics is problemsolving and it is amazing how little Jim depends on standard ways of doing these things. Jim isn't online but he'll see your comments once he gets the hardcopy version. I'll say thanks for the compliments on his behalf. I heartily agree with your assessment of Jim's problem-solving on these pages -- great inventiveness on every page. More amazing is that he can actually teach these techniques to others. You might not know that Jim was a cartooning teacher off on and for many years. I took one of his classes (despite being utterly unable to draw) and saw for myself that he uses lots of great examples of creative problem-solving in his teaching that gets the students' juices flowing. Too bad there's no art schools in Orlando that teach cartooning. Jim has a gift for teaching that is going to waste these days.